Selfie struggle. Charcoal on paper. This entry was posted on September 5, 2017 by sallyparnisartist. 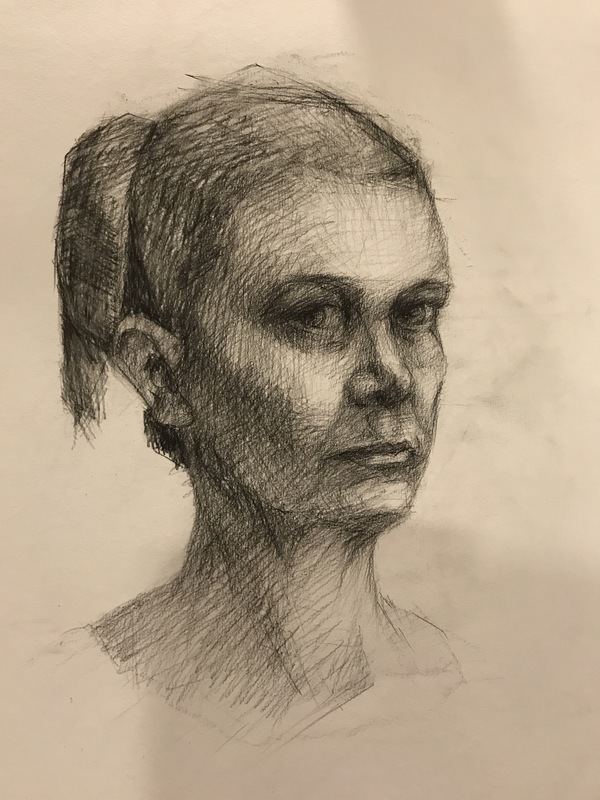 It was filed under Adelaide, Art, Artist, australia, contemporary drawing, daily drawing, drawing, figure drawing, life drawing, observational drawing, Paid work, Teaching and was tagged with charcoal, form and structure, Teaching. Great drawing. However looking very angular. Some of the marks look like you’re laying down a tone without describing contour. (This might relate to the last exercise you posted, which I haven’t viewed properly). I’d hold the pencil gently and play with different grips for each angle, including swapping hands. A second mirror on a music stand can help avoid the confronting return stare.